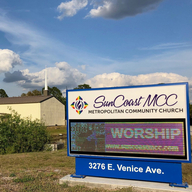 SunCoast MCC is part of Metropolitan Community Churches an international Christian denomination, representing approximately 300 congregations. We provide a home to all who are seeking to discover and express their unique spiritual paths learning the word of God through education and fellowship. As a welcoming, diverse and active community, we share God’s love in a spiritual environment offering Truth, Trust, and Transformation.